The school children which are lucky enough to enjoy a canoe tour on the Jacques-Cartier River in Quebec, Canada in Autumn, will learn about the wilderness, the wildlife and be able to see first hand, the spectacular colors of the forest trees during Autumn. The school children which encounter this tour are amazed at how much they learn and realize how beautiful the surroundings are within their home province. Group of school children in a canoe on Riviere Jacques-Cartier, Jacques Cartier River during a field trip in Parc de la Jacques-Cartier, Quebec, Canada. 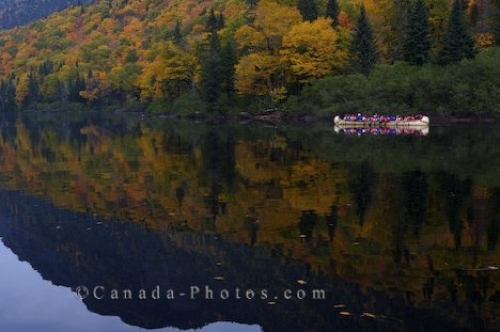 Picture of school children on a canoe tour on the Jacques-Cartier River in Quebec, Canada surrounded by Fall colours.